The kids are back at school and while I didn’t get much done on my Familiar series during the school holidays, I made a conscious effort not to stress out about this. I did get to do a little research for my works in progress, I started this “blog”, I started chatting to other authors for the “Writer Chats” (suss them out here) and I did a bit of reading too:-). So without further ado… these are the books I have enjoyed this month. Autumn’s Dance by Sarah Gai (indie) – this is a young adult, contemporary, Christian romance. While I don’t usually read Christian fiction, or young adult, I really really enjoyed this book. I recommend getting tissues if you read it, as I ended up in tears at the local cafe and on explaining the story to my hubby (a very down to earth Aussie country bloke type) he got a little watery-eyed too. So if you like books that tug at the heart strings and you like tortured heroes or heroines, then you’ll enjoy this book. Sarah and I regularly chat, you can check out some of our writer chats here. Empire of Storms by Sarah J Maas. I really loved this book. Actually, I really love this series, especially after book 2 where the story and characters get more complex. I like the characters, I love how she weaves the plot. In this particular book I found myself obsessed with the romance in one of the sub plots (I do love a tortured romance!!). Weirdly I keep finding these books in the kids’ section in shops like Big W. Why on Earth they stick them in there is beyond me. I really think they need to reconsider that classification. A Court of Thorns & Roses by Sarah J Maas. While the other series is more general fantasy (think: witches, dragons and fae) this series is particularly about faeries. I found it interesting and I’m curious to see where it goes in book 2. Rising Saints High (series Goo of the Gods) (indie): by DP Joynes. 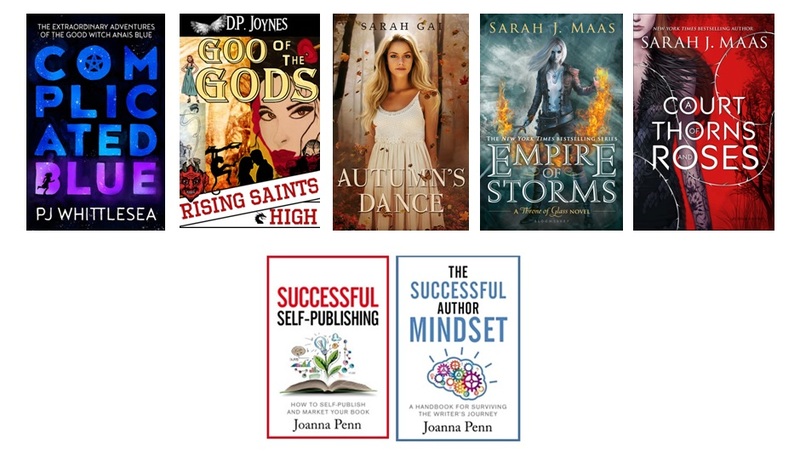 Rising Saints High is Dena’s first book (you can check out my first writer chat with Dena here). It’s a fun story where the nerds are the heroes in an angel vs demons kind of battle (I’d describe it as Buffy meets Scorpion and if you like those kinds of TV shows I think you’ll enjoy this:-). Dena’s working on the second book in the series too and so if you read it and love the world, you’ll be pleased to know there is more on the way:-). Anyway, that’s all for this month’s round up. Now that the kids are back at school and I’m writing again (more about that in the next post or two) I’m not sure how many I’ll get through but I’ve got a few on the list and so I’m looking forward to getting started on it;-). Writer chats 3: Chatting with Angela Stevens about writing habits, schedules, genre definitions and more!